Much has been written of late of the Internet of Things (IoT) and its impact on many industries. Oil and gas, despite the ongoing price decline, is no exception. For those of you not familiar with the concepts of IoT, the idea is that moving forward we’ll have a myriad of tiny Internet connected devices embedded in all of our field equipment. These devices will be focused on monitoring and sending data back to the mothership for review. IoT always reminds me of a science fair project I did with my daughter a couple of years ago where we had to measure the vibration caused by a solar powered toy when subjected to light of different colors. To measure the vibration, we simply downloaded a seismograph app onto an old smart phone, then configured it to transmit the data back to a PC for collection and analysis. In effect, we turned an old junk drawer smart phone into a remote earthquake monitor. What about the broader perspective? What happens when, in monitoring the data, we identify that equipment manufactured by a specific supplier is prone to failure or that we’re statistically having more incidents in a specific location than we should? Such data prompts an investigation, and more often than not, that results in a project request: a process improvement exercise, a supplier evaluation, an investment in new materials. This is where we come in with project and portfolio selection. How does a company implement a structured methodology for assessing the business case of these projects? How are the investment requirements to support one project balanced against the needs of the overall organization? After all, what is the point of implementing a sensing mechanism to feed data back to us when there’s nothing in place to structure decisions based on that feedback? I’ve been reading Henry Mintzberg’s The Rise and Fall of Strategic Planning of late. It’s been a bit of a slog, primarily because I’ve been trying to read it on flights (which puts me to sleep) or at my daughter’s roller derby practice (which causes the other parents to mock me mercilessly*). There’s an interesting thought presented very early in the book that has caused me to reflect a fair bit as I’ve been delivering presentations on strategic planning over the last couple of weeks. The basic concept is that strategic planning is really an example of Taylorism as applied to the C-Suite. A quick sojourn into the world of Taylorism…..otherwise known as Scientific Management: this is the concept that all work can be broken down into a series of manual steps. This work is performed by the workers at the rubber-meets-the-road tier of the organization. The workers are then watched by the supervisors, whose job it is to ensure the workers follow the agreed upon procedures. The supervisors then implement the procedures defined by the manager class – who by dint of their intellect and college education are qualified to develop the procedures that trickle down. The entire thing these days and in some sectors smacks somewhat of the Eloi – Morlock dynamic, but in all fairness brings a fascinating perspective to the operating theories underpinning many modern organizations. In fact, I might propose that most organizations I’ve worked with ostensibly reject the concept of Taylorism while simultaneously building the structure to support it. The book points out though that attempts to processize the strategic planning, well, process, have repeated the same structure, but this time pushed it upwards into the C-Suite and removed much of the art of strategic planning by replacing it with a mechanism to review goals from last year, adjust and issue a new plan for this year. Collect the list of requests for the next annual plan. Define the long term goals and investment areas for the organization. Decompose the goals to develop a project portfolio leveraging the principles of enterprise architecture. In the first portfolio, the reactive one, we simply have to collect all of the requests from the organization, run them through an analytical hierarchy that was defined per some other set of formal processes, and we have a portfolio. In the second portfolio, the proactive one, we swap out the sensing mechanism of order taking with one that is a bit more proactive, i.e. mapping fundamental strategic change to the scope of the projects in the annual plan. Regardless of which portfolio you support, the general premise however is that if we follow these two approaches to the letter, we will have success in our strategic planning. Each asset would then be owned by a specific individual, a program manager who would be responsible for allocating funds to best guarantee the asset meets the needs of the organization. The prerequisite for this to work? A clear definition of where the organization would like to go – and how each asset supports that definition. Note how this structure meets a clear need, that of transferring ownership of the project and the defined initiatives to the teams responsible for doing the work. That is what a strategic planning function would look like if we designed it in a manner consistent with the principles of modern information worker process design. *…despite my protestations that reading a book like that at roller derby practice reflects the duality of man…you know, the Jungian thing). 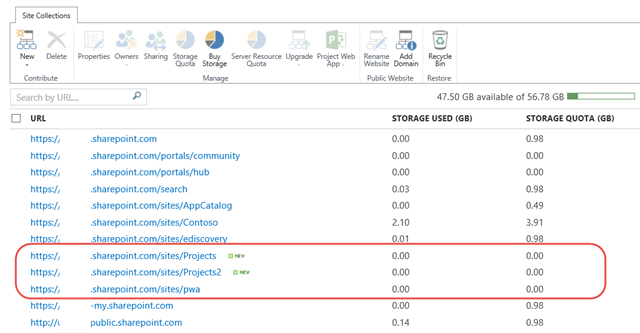 After more than a year of watching folks adopt Microsoft’s Project Online, one thing we’ve noticed is that most organizations tend to have multiple Project Web Apps (DEV, PROD, Marketing, IT, etc.). Additionally, many organizations prefer to modify the default URL to something that’s a bit more user friendly, i.e. 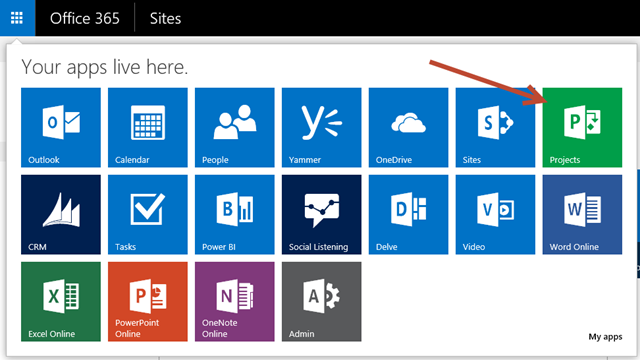 the default https://tenantname.sharepoint.com/sites/pwa site often becomes /sites/projects or something like that. 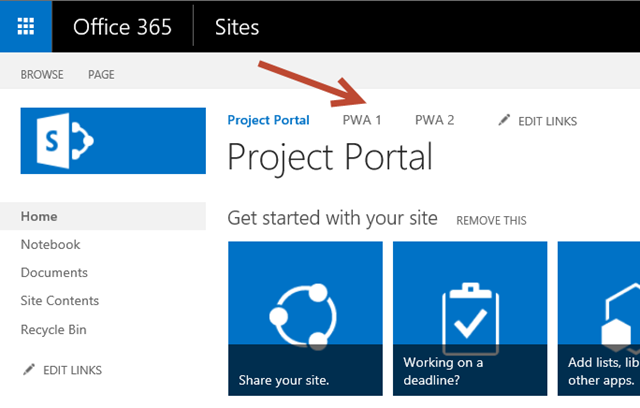 The issue is that the default button within Project Online is hardwired to go to the https://tenantname.sharepoint.com/sites/pwa URL. If that site is deleted, that button becomes useless. After deleting it, provision a new team site at that location, i.e. with the same url: https://tenantname.sharepoint.com/sites/pwa. Grant access to everyone in the organization to this page. And now you can create a couple of PWA sites. ….and add those links to our site at /sites/pwa. You now have a project landing page hooked into the navigation button that can be used to redirect folks as appropriate.